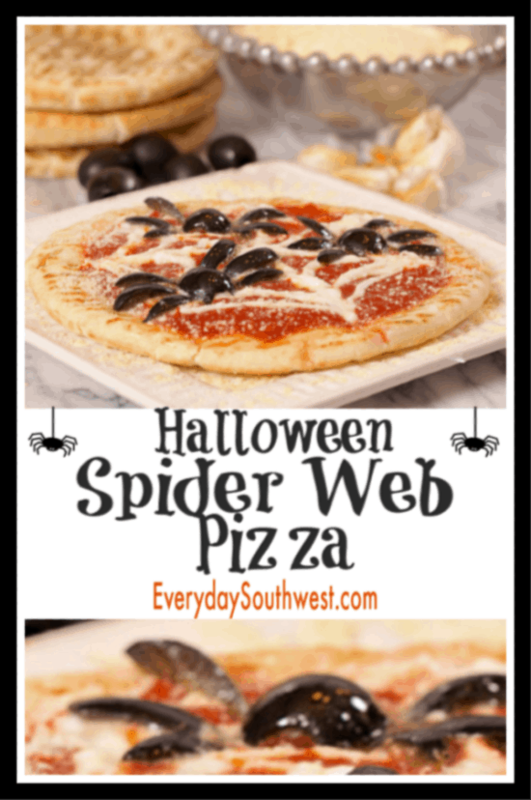 Halloween Pizza Recipe with cute olive spiders and cheese-y spider web is a fun way to “dress up” your Halloween dinner or snack. The individual size pizzas make a super fast and easy Halloween Party Food. We loved Halloween as kids! Back then, Halloween was all about dressing as a hippie or a hobo and running around the neighborhood trick or treating with friends. Today, Halloween is more about big parties and spectacular decorations but… it’s still about friends. 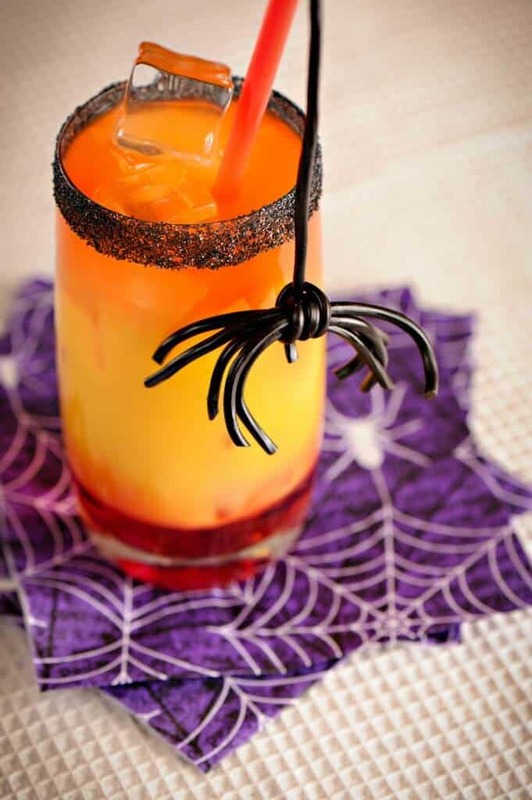 Halloween may have become a little fancier these days but, it can be just as tasty. Here is an easy Halloween Party Recipe that is so quick and easy that you will have plenty of time to enjoy your party. 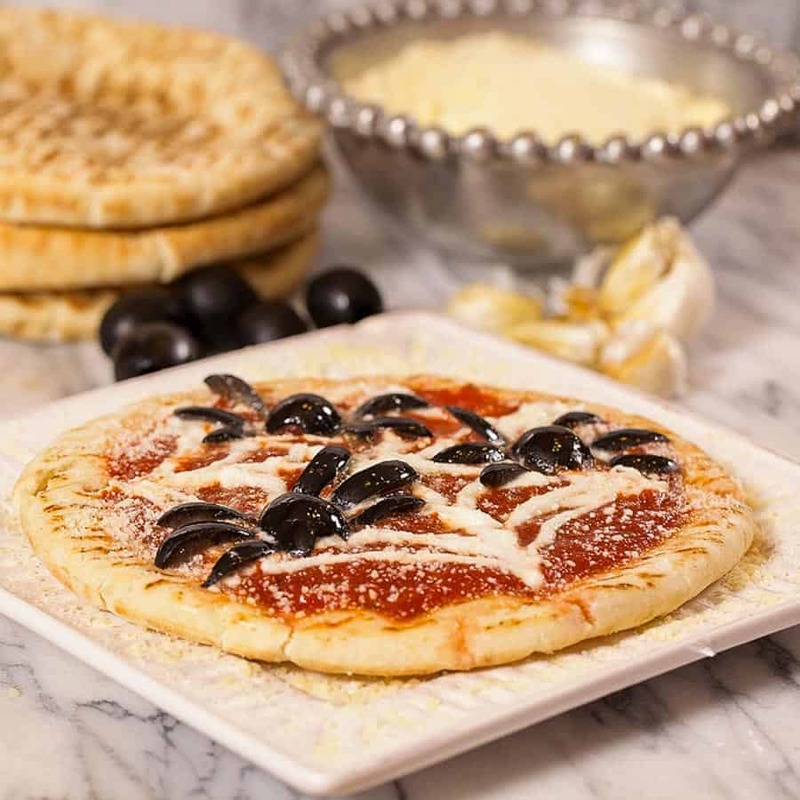 This little Halloween Pizza Recipe makes a great “grab and go” dinner for any trick or treater and is a favorite Fright Night Party Recipe at Donna’s house. This Halloween Pizza Recipe has been a fan favorite recipe for years so, I have updated the post with more photos and our easy to use printable recipe plugin. Please print it out and keep it on hand for Halloween party food ideas, after school snack or fun family dinner. Donna originally posted this recipe in 2014, here is her original post. 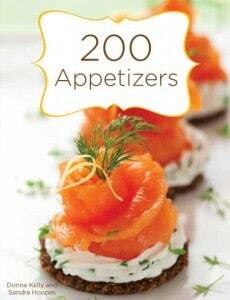 You will find the recipe at the bottom of this page. “One easy, fun and festive way to let your food “dress up” for Halloween: Spiderweb Pizza. With apologies to all y’all who dislike cutesy food, I share this Halloween pizza because, well, it’s just too cute not to share. I have been making black olive spiders for 30 years – and turning my deviled eggs into spider eggs. 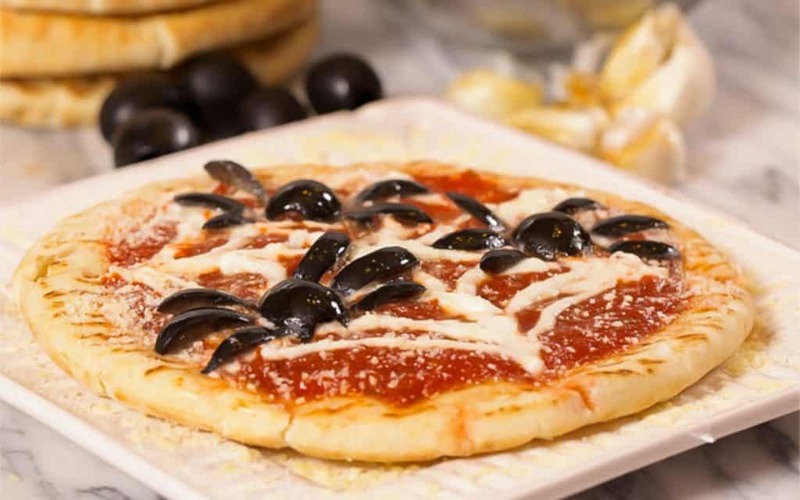 So, why not add spider olives to pizza? I asked myself. Turns out, there’s no reason. For each spider olive, you will need one jumbo olive and one medium olive. Cut the jumbo olive into thin lengthwise slices for use as the spider’s legs. Then, cut the medium olive into halves lengthwise to form the body of the spiders. Annnndd . . . that’s it. Just add these beauties to individual pizzas and turn your easy pizza dinner into a Halloween party! To make the spider web, you have lots of choices: sour cream, cream cheese or Greek yoghurt all work well. You could also use string cheese and use thin pieces of the cheese to form the web. Easy – peasy, I promise! Ask the kids to help, they love creating the spiders! Kids can make these for an after-school snack if they use the microwave or toaster oven and don’t forget the plastic knives! Finally, have plenty of extra olives, the kids will want to play with them and stick them on the ends of their fingers… I know I do. Print this fast and easy recipe to keep in your recipe box, it’s a great dinner with or without the spiders! This pizza also makes a great afternoon snack. If you show your children how to make it in the microwave, they can make it themselves! I hope you love this recipe as much as we do! Please leave a comment or question on this post or follow Everyday Southwest on Facebook and leave a comment there, I’d love to hear from you! 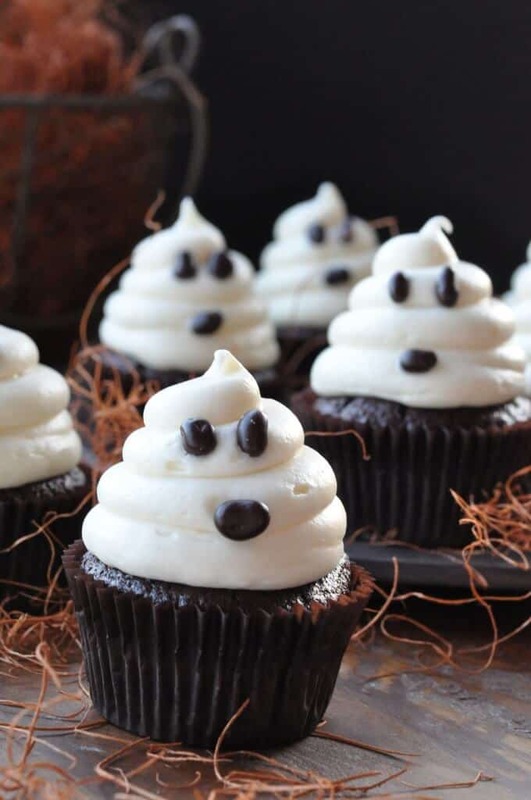 Halloween Ghosts on Easy Carrot Cake Cupcakes– need a last minute dessert? No problem. These cupcakes are made with a “dressed up” cake mix recipe. 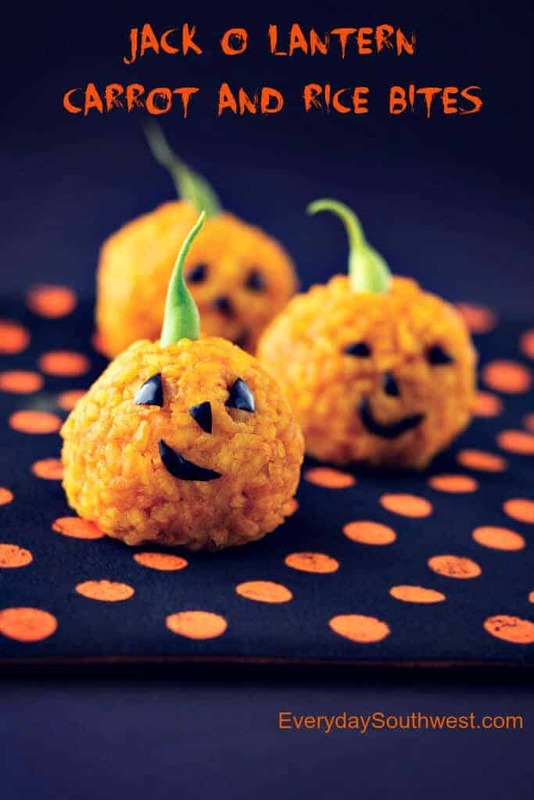 Jack-O-Lantern Carrot and Rice Bites are a healthy halloween snack and a fun treat for dinnertime! Great Halloween Party ideas can be fast and easy. 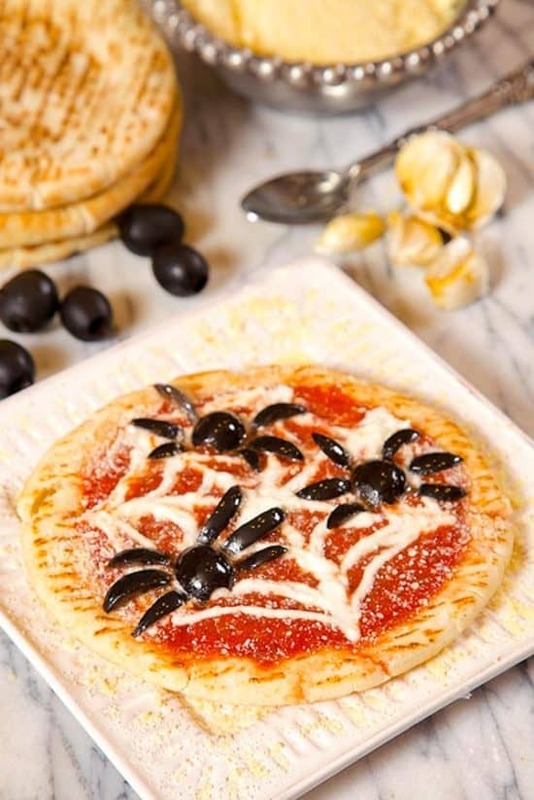 This Halloween Pizza with Olive Spiders and Cheese-y Web is perfect for your party, lunch or after-school snack. Cut cheese into long, thin sticks about a 1/4 inch thick. Cut small olives in half lengthwise for the "spider bodies" and each large olives into 6 or 8 long slender strips or "legs." Lightly coat sheet pan with vegetable oil or baking spray. Place pita breads on sheet pan and spread with desired amount of marinara sauce. Heat extra marinara and use as a dipping sauce. Arrange cheese sticks into a spider web shape. Cut and trim cheese sticks as needed. Place small olive halves on pita breads and arrange olive strips around olive halves to look like legs. Bake until cheese is melted and pita bread is heated through, about 10 to 15 minutes. Sprinkle with parmesan cheese. Serve. Oh my gosh, the olive spiders are the cutest! What a fun festive snack idea for Halloween! I love that this Halloween pizza is quick and easy to make. Yum! I love this cute idea. Plus olives are my favorite pizza topping.